One thing is clear – Rochester was far from sleepy when canal boats like Lois McClure passed through downtown on the original Erie Canal. The city is woven of old and new, an intricate mix of historic and modern buildings. For several days, the Lois docked on the Genesee River at Corn Hill Landing, the waterfront for the beautiful Corn Hill neighborhood. We hosted residents, tourists and students from the Rochester City schools. Among the visitors were many attendees of the 2010 World Canals Conference. Here was a seasoned audience for touring our replica canal boat! I learned from these canal enthusiasts the story of the nearby aqueduct, under what is now Broad Street. Literally a bridge filled with water that spanned the steep banks of the Genesee, now the aqueduct is covered by Broad Street. It is still accessible by foot and there is talk of re-watering it, lead by Tom Grasso, a local college professor and canal enthusiast. The locals recommend a visit to High Falls. From a tall pedestrian bridge, the view includes the spectacular waterfall and dramatic signs of early industries. A raceway once ran along the rim of the steep gorge, providing water power to the mills in the area. Subterranean channels are cut into the gorge from the buildings above, resembling a labyrinth of passageways suitable for trolls. 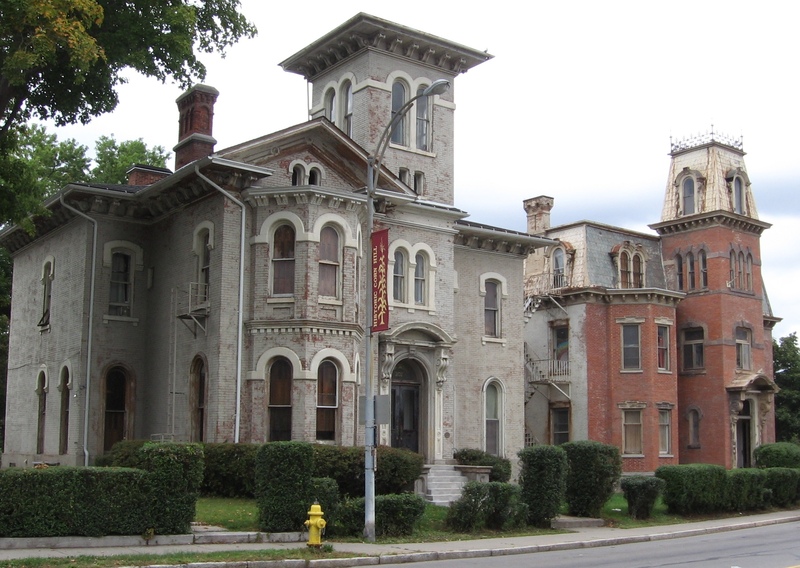 The historic downtown and beautifully preserved homes of Corn Hill are a reminder that the Erie Canal brought trade and oftentimes wealth. Fortunes were made moving goods such as the famously soft Genesee Valley Flour, milled in Rochester. It took some rambling through Rochester’s streets and museums to understand that the canal brought more than raw materials and supplies – it brought new ideas. A few blocks from our dockage at Corn Hill, the great abolitionist, Fredrick Douglas published the anti-slavery newspaper The North Star. Early Erie Canal boats also passed by the residence of Susan B. Anthony, stalwart activist for womens’ rights. Rochester was a great stage for nineteenth century history, complete with speeches, marches, even riots. Today, it is beautiful, gritty, innovative, idealistic, still fighting for a better future – truly an American city. Laura works for the Lake Champlain Basin Program, a federal, state and local partnership that is implementing a management plan for Lake Champlain and its watershed. Laura works with the public in the Resource Room at the ECHO Aquarium and Science Center on the Burlington waterfront. Twenty years ago, in October, she was employed as an interpreter in the museum’s stone schoolhouse, then the only building at the new museum!